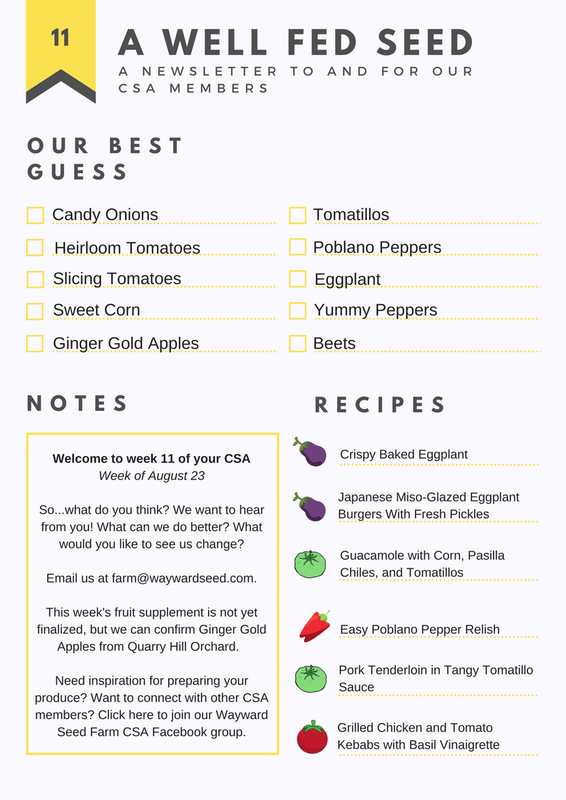 Thanks to CSA member, Ashley, we have a new recipe template! Please enjoy these recipes (some of which you’ll have to wait to use) and tips for storage. I want to share some exciting news with you. We are finally starting the process of purchasing a farm less than 3 miles away from our current leased farmland in Sandusky County. We have waited for an opportunity to purchase this property for many, many years. It’s going to take some patience, but hopefully we can push through and complete the sale. The property will enable us to expand production slowly through a wider rotation and increased acreage. This will prevent disease and maintain high quality soils throughout both farming locations. Building quality soils takes time and investment. We have been modifying our fertility management practices through the years to combine cover crops, manure, compost and minerals. Greenhouse production for this season has been cranking along now for the last couple of weeks. Fennel, shallots, leeks, celery root and many other varieties have started to emerge. We will propagate peppers and many other crops next week to ensure a steady supply this summer. It’s very important for us to connect the dots this month in terms of how many members we are growing for. Are we growing for you and your family this year? With the new farm a possibility, we want to be conservative and not overproduce quantities and varieties of food that we don’t have a home for. It’s been 12 years since this project got started and in my mind it feels like yesterday. My body doesn’t agree with that sentiment. Time flies, but for Jaime, myself and our employees the goals that we set forth over a decade ago are starting to look possible. All of you, our CSA members are the cornerstone piece that fostered all of this ambition. So here we all are. From nothing to something, an idea can become reality. I’m proud of all of us. We built a farm together and that is what this is all about. Thank yourself. We thank you for the investment all of these years. Everyone considers them, many people set them. Very few people keep them. I’m in the category of people who set them, and sometimes, I even keep them. There’s a certain renewal to the new year, and one that excites me. It feels like an opportunity to shine again, start anew, do better than last year. And the most exciting part of a new year? It happens twice! Twice? Yep! Twice. The first new year is the traditional one, January 1. This year, I have a few resolutions, although none that I feel I’ll keep. Even so, I’ll try for a little while, until the chaos of running a business sets in again and life just doesn’t provide me the time. Because that’s the thing about resolutions. More than anything, I find that resolutions require time. Time to do things differently, try new things, get us out of routines we’ve honed and crafted over time. So what is the other new year? It’s the one I celebrate at a certain time of year, depending on our season, when the CSA season is over and I have a chance to reflect. Almost always, I feel like I could have done better. At the end of a long season, I feel both tired (okay, exhausted) but excited. And truthfully, it’s not that different from how I feel now in the traditional new year. But I prefer this over the traditional because I usually feel like I can actually make change, as if it’s truly possible to do better. But before those plans can be made, we need to reflect. I had big plans for 2017. It was going to be the first season in many where I would be full-time to the farm again. I would take pictures and write fabulous newsletters. I started a member only Facebook page. I would be more engaged in day-to-day farm activity. I took classes for social media, photography and general business development. I had ideas for new relationships and partnerships, new ways to engage CSA members and ideas for advancing our little farm to its next chapter. It doesn’t sound like much to simply improve the experience people have with our farm, member or otherwise, but nonetheless, important and what people are searching for in today’s marketplace. And Farmer Adam just keeps producing more food each season. So unfortunately as the farm improves its production, my service to our members sometimes suffers. There’s more food to sort, pack, store, deliver and sell. It’s a strange effect in the opposite direction. And while I don’t need to go into more detail (our members know that by August, my newsletters stopped coming), I’m reflecting again on the season’s past and thinking about the year to come, eventually asking the hardest question of all… “Is what I want even possible?” “Can we grow our business, sell more vegetables and still meet all the demands of a constantly changing marketplace?” Recent nationally printed articles featured on farms like ours sound all too familiar and leaves me contemplating this reality. How much can we achieve in a season when the demands our personal and professional life seem too steep? So finally, after all that, what are my new year’s resolutions? Well, I’m still working on them. But here’s one to whet the appetite for what’s next. Eat more vegetables. Personally, I’d like to enjoy more of the vegetables we grow in the peak of season. But it’s more than that. While I eat more than my fair share in the field, from the dirt, raw and uncooked, the idea of an actual meal, prepared fresh and served on a plate sounds glorious. Oh, and I’d like to sit at the table while I’m eating it. Start writing now. Professionally, I’d like to anticipate the season a bit more and not foolishly believe that I can do everything in real-time, as it happens. Writing in the middle of the season? I think I have enough experience to know it’s not likely. Or maybe, just maybe, I’ll realize that doing a little bit less would be good for me and the farm. So by next time, I’ll have a list of things I can stop doing, things I can say no to, or in the case neither of those two are possible, ways to once again, try to do better in the new year. But, before I do anything, I’m going to take a few days to work lightly. That’s not to say time off, we’re a year-round business, you know. But maybe I’ll sleep in for a week and work from home? Maybe I’ll go for tea at Cambridge Tea House and do some writing. And maybe I’ll just jump right to it and start working at doing better. Hello all, and happy holidays! A few fun facts and comments from our latest, greatest season of farming in the flatlands of Sandusky County, Ohio! Too much rain could be the worst thing for a vegetable farm! At one point in early July we had 7 inches in one week?! I’m surely glad this season’s ups and downs are finally over and we can rest a bit. It was a big challenge to produce consistently this season. I’m hoping we can learn from these extreme weather events and plan accordingly. If you lose a planting or two, what crops can you replant or substitute in place of the original production schedule? Yes, hot pepper are blazing at times. And especially productive when watered and maintained properly. I’m sure our members have seen more hot peppers in your share the last two years. We have been contracting with our partners, The Brinery in Ann Arbor, Michigan to provide peppers for their fermented sauces. We will use restraint for 2018. They are very potent but delicious! Onions, onion and more onions. By far our best year of onion production at WSF. We are blessed to offer lots of onion diversity. Perhaps the most important foundation to your cooking, never downplay their use in building great flavors. We had a large beneficial predator bug population at our farm this year! Great numbers of lady bugs and braconid wasps were present. People ask me all the time, “How many workers do you have at the farm?” It varies greatly through the season. We have a base staff of 5 people year around and as many as 12 people in the field during the fall harvest. We do you have many machines at the farm to assist production but ultimately almost 100% of our food is still hand harvested. Lots of hard work but mostly tight attention to standards and sizing of our products assure better quality in your CSA boxes. Our staff is really the cornerstone of the operation. We can’t thank them enough. Really. My favorite vegetable of the 2017 season was Broccolini – I couldn’t stop eating it. Raw in the field, grilled, steamed or sautéed. It was a fun and rewarding trial season for that product. I hope our members enjoyed it. We will definitely be growing it again for our members! 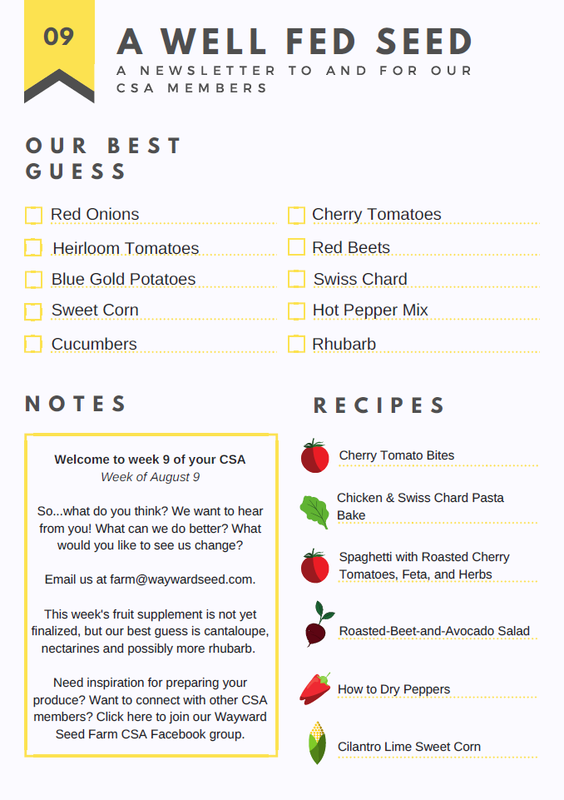 Thank you to our CSA site coordinators, volunteers, employees and membership. We are tired (okay, really tired) after this long season and look forward to a restful holiday. We hope to see you at the Worthington Farmers Market on Saturdays throughout the winter. PS: Sign up for 2018 is live, and we’ve made a few changes. Questions? Email us at farm@waywardseed.com.